Rev. 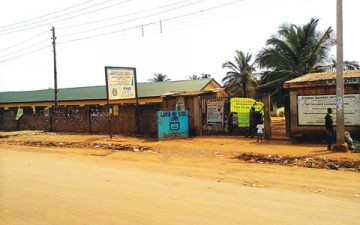 Olufunke Oladeojobi,Principal of Ajuwon Senior High School, Ajuwon, Ifo Local Government Area, Ogun State, has been quizzed by the police for allegedly conducting virginity tests on the pupils. Oladeojobi, who was described as a strict disciplinarian, by her pupils called in a nurse and jointly carried out virginity tests on a group of 10 students last week Monday. It was further learnt that the principal did not seek the consent of the parents/guardians of the pupils before conducting the test on Senior Secondary School 1 pupils. During the test, it was alleged that the principal and the nurse whose name could not be ascertained allegedly dipped their fingers into the pupils’ private parts. After the exercise, which took place at the principal’s office, each of the pupils was given an exercise book. A 15-year-old pupil, who identified herself simply as Ayo, said the principal came into the classroom on the day and announced that all female SSS 1 pupils should converge on the assembly ground. She said the principal subsequently asked that those who had yet to lose their virginity should stand apart. Ayo said, “We are over 600 in SSS 1 but only about 300 of us are females. Those of us that are virgins are 38 and we were matched into the principal’s office with the assistance of members of staff. Ayo said she became apprehensive when everyone who emerged from the office where the test was being carried out came out with a sad and disgusting look. She said, “When my class captain emerged from the room, I asked her why anyone that came out of the office looked depressed? I was held spell bound when she told me that the principal and the nurse dipped their fingers in turns into their private parts, adding that she had started bleeding as a result of the penetration. “Just as I was asking further questions from her, the principal dashed out of her office and announced that she had discovered one student who had lost her virginity out of the 10 students that were examined. Thirteen-year-old SSS I pupil of the school, identified simply as Ujunwa, said the principal was happy that she was able to “catch a promiscuous pupil” as she felt proud to discuss it on the assembly ground the next day. She, however, added that her joyous moments was soon short-lived when the parents of the 10 pupils stormed the school in protest against the development. The pupils rebelled against Oladeojobi last Wednesday as they did a sit-in on the assembly ground protesting and demanding that she should be redeployed from the school. It was gathered that it was the teachers’ intervention that calmed the pupils. Ujunwa said, “The parents of the girl that was said to have lost her virginity who happens to be a member of the Press Club and the other nine parents besieged the school last Tuesday and Wednesday and queried our principal for conducting such an unauthorised test on their children. When our correspondent visited the school on Tuesday, the school had closed for the term while Oladeojobi’s office was shut. Her telephone rang out while a text message sent to her phone was not responded to. When contacted, the Divisional Police Officer of Ajuwon Division, Mr. Waheed Yusuf, a Chief Superintendent of Police, confirmed the incident to our correspondent. But, a policeman attached to the station who spoke on the condition of anonymity said Oladeojobi owned up to the incident. He said, “She confessed that she conducted virginity tests on the pupils and that ‘she was trying to help them.’ We took her in for questioning on Thursday and Friday but she was not detained as my superiors were taking into consideration that she is a civil servant.